Space Buddies is the delightful family tail... err tale about a group of Labrador puppies which follows from the highly popular Snow Buddies movie. 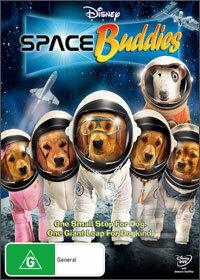 Reminiscent of movies such as Babe, Space Buddies revolves five puppies who happen to get themselves in a variety of comical misadventures. The story begins with the puppies investigating a private corporations attempt at space flight and when their owners go away, they all sneak to out to watch the first private space flight. Not happy by just watching the flight from the distance, the group of puppies decide to investigate even further, somehow managing to don "dog" space suits with B-Dawg (Skyler Gisondo) leading Buddha (Field Cate), Budderball (Josh Flitter), Mudbud (Henry Hodges) and Rosebud (Liliana Mumy) on board the unmanned test flight. Of course things go astray and it's up to buddies to set things straight as they visit a mysterious Russian space "ghost" satellite led by the crazy Russian Yuri (Diedrich Bader) and his dog Spudnick (Jason Earles), land on the moon and are helped back to earth by Gravity, a ferret who is based in mission control. With some great acting by all involved, especially the voices of the buddies and the humans who star in this movie, Space Buddies is the perfect family move from irresistibly cute puppies who look too cute for school, the occasion "fart" joke and some high adventure. It may clichéd, glam and contrived but it's hard not to like about a group of talking puppies as they explore space and become the heroes of their town. On DVD, the video quality features sharp images and vibrant colours, however the standout feature is the surround sound video. After you've finished watching the movie, the special features are quite entertaining, especially the mock "Buddy Bloopers". Needless to say, Disney have released a first class presentation, even though it's a straight to DVD movie.